AmeriColor® Gourmet Writer™ Pens add vibrant color to any dry and firm food surface. 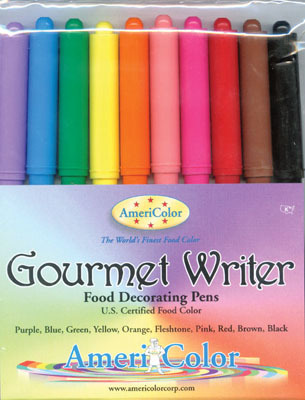 Our Gourmet Writer™ Pens can be used directly on royal icing, marzipan, donuts, bagels, gum paste, milk Jell-O, petit fours, bread, pastillage, fruit & vegetables, rice paper, hard-boiled eggs, and white chocolate. They are also perfect for stenciling, stamping, or freehand detailing. No other products compare to the quality and consistency of the colors in our Gourmet Writer™ Pens. Since the tip of the pen is precise and flexible, there are many techniques that can be used to create bold or thin lettering, swirls, colorizing, drawing, decorating, and graphic elements. Use Gourmet Writer™ Pens to draw fine, medium or broad lines, depending on the angle in which the pen is held. Set includes 10 different colored writers.